The Water Knife is a novel set in a not too distant future USA struggling to deal with environmental changes. In particular, it's set in Arizona, where the city of Phoenix has become a zone of refugee camps, Red Cross water pumps, middle class people counting the gallons in their water cistern every day, but also self-contained biodomes (arcologies) and ultra-rich people live in luxury. Angel is a contractor / mercenary working on behalf of a water company - the so-called Water Knife of the title. Lucy is an investigative reporter. Maria is a young refugee trying to get by in a mob-run brutal and ruthless area of town. The domino that starts the chain reaction that will intertwine their stories is the vicious torture and murder of two men over a document that may or may not exist - a document of legally binding water rights. At the start of the novel, the world building feels a little preachy. Several times, characters discuss the wilful blindness of their ancestors in driving their environment over a cliff and building cities in unsustainable places. This blunt and explicit approach is not quite as subtle as Paolo Bacigalupi's novels usually are. Basically, we're being told off and our noses are being rubbed in it. It's a little offputting. It won't convince anyone who's in denial. It also did not entirely convince me. Not the environmental calamities: those seem all too imaginable. In fact, there are regions of the world where water rights are the source of fierce and bitter conflicts right now. Arguably, Israel is comparable to the Las Vegas and California of The Waterknife's world, while the West Bank is comparable to Phoenix (with the caveat that Israel cares nothing for laws and legal process, while in the novel everyone is involved in lengthy legal proceedings before deploying their water knives to enforce rulings). The problem is that I don't quite believe Americans will split by state lines. Israel and Palestine both contain Muslims and Christians, Arabs and Bedouins, but over time, the conflict has become essentially one of Jews and Muslims. Christians, Druze and other people are sidelined in both regions. So, in an ever-more divided America, I don't see the State lines as being credible dividers. I could imagine it being religion, or race, or even politics: I can more easily imagine a Democrat vs Republican conflict turning into mass migrations and then regional divisions. I just can't see it happening based purely on whether someone is Texan or Nevadan or Arizonan. Once the story gets moving, it's a good thriller, with various parties chasing after macguffins, information or fortune, and being chased by murderers, conspiracies and the occasional deadly riot. There's tension and cliffhangers aplenty. Violence, too: some of the characters suffer pretty permanent consequences. 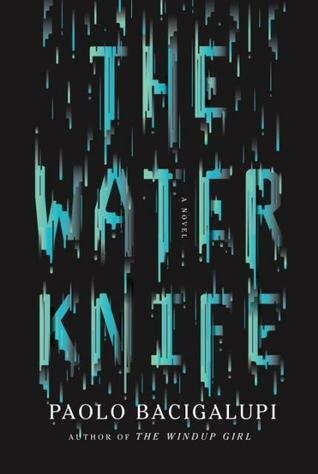 The Water Knife is unusual in that it is neither a post-apocalyptic novel nor a pre-apocalyptic one. This is a novel of collapse in progress. #Phoenixdownthetubes. It reminded me a little of the (more literary, subtle and hugely accomplished) Random Acts of Senseless Violence, only this time the driving force of collapse is environmental rather than economical. There are not many novels telling stories set during a gradual fall of our civilisation. As things race towards the end, the book becomes utterly gripping. Every plot development feels authentic, even when things twist to and fro: every twist comes from within characters rather than feeling imposed by the needs of story pacing. It really grows on you (as do all the characters). If you can get past the slightly clumsy beginning and bear with it, you'll be richly rewarded: the finale is masterfully done, and the pacing is good throughout.